I've always had a fascination for Asian cosmetics, particularly those from Japan and Korea. They seem so different and out of this world, and somehow seem so much better than the cosmetics we have here in the Western world. When I first discovered Memebox, a different kind of subscription box, jam packed with beautiful Asian cosmetics and skincare, I was in heaven. 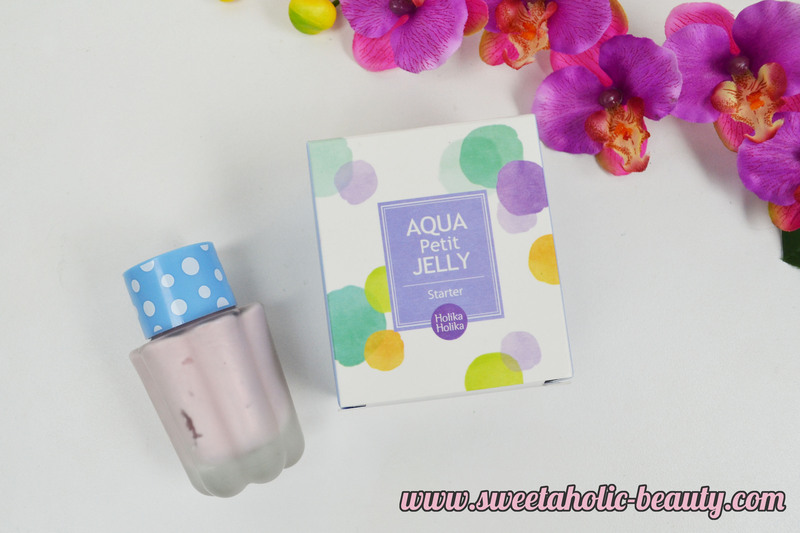 I grabbed the Holika Holika box and received this Holika Holika Aqua Petit Jelly Starter. I literally had no idea what this was, and really needed to do some research. Upon browsing the internet, I've discovered that the best way to describe the Holika Holika Aqua Petit Jelly Starter is as a primer. The brand describes their product as a "water-based makeup base." 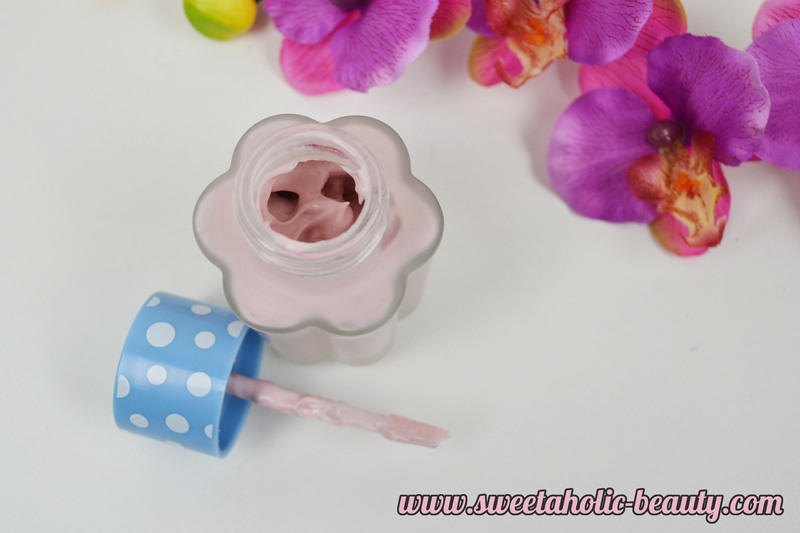 The primer came in this adorable little bottle which is beautifully unique. There seems to be a fair amount of product in the bottle too, which means this will more than likely last forever. Yes, that's right, the product actually is a shimmery purple/pink shade. I was a tad worried when I first tried this out, as I wasn't sure I had read up correctly. The consistency is very similar to a jelly; it's fairly thick in consistency but incredibly easy to work with and smooth out. The scent was nothing outrageous - it reminded me of most other Korean and Japanese cosmetics I've tried. A subtle scent that doesn't linger. The weird thing about this primer is that it also came with a sponge, which is what you're supposed to use to smooth it onto your skin. I've been using the sponge, and I have to say it does make life so much easier when applying to your skin. It really helps to create a nice smooth finish and blend in the shimmer. When applied to your skin, it feels very wet, but dries very fast. According to Holika Holika, it contains Vitamin A and Vitamin C to help nourish dry skin. Sometimes I like to wear this alone, as it really cools down my skin and helps me feel refreshed. Swatches - Not blended. Blended slightly. 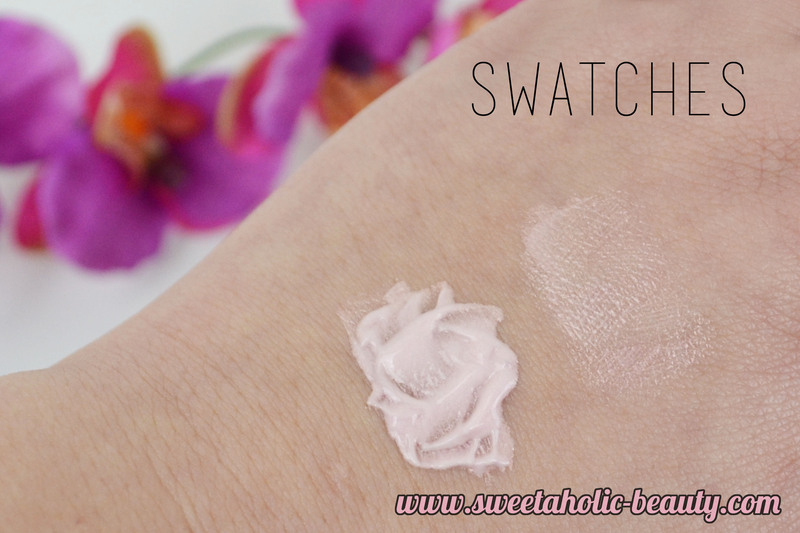 As you can see from the above swatches, when it's only blended a little, it leaves a lovely shimmery finish which could be doubled up as a highlighter above makeup. Once you rub it in completely, the shimmer almost disappears and your skin is left looking fresh and clean. Apparently there are "water shine pearls" in the formula that reflect the light and help to make your skin glisten. In saying that, once applied and blended in correctly, you definitely don't look like a disco ball. 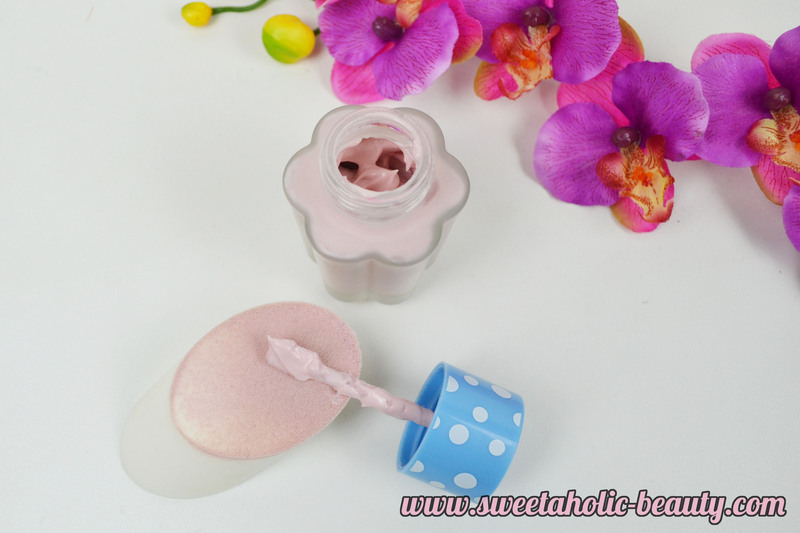 I've been using the Holika Holika Aqua Petit Jelly Starter as a primer for about six months now, on and off, and I've been loving it. As I mentioned before, it really does help to keep my skin looking refreshed, but I've also noticed it really helps keep my makeup looking fresher for longer. Once I apply my full face of makeup, it helps to keep everything in place for the entire day. My verdict? I love the Holika Holika Aqua Petit Jelly Starter, and will definitely be buying a replacement once this one is finished. (In about 50 years or so...) I would highly recommend this to anyone who is looking for a nice hydrating primer; especially someone who may be travelling and double up and use this as a highlighter. You can grab this on eBay for a pretty decent price, too. 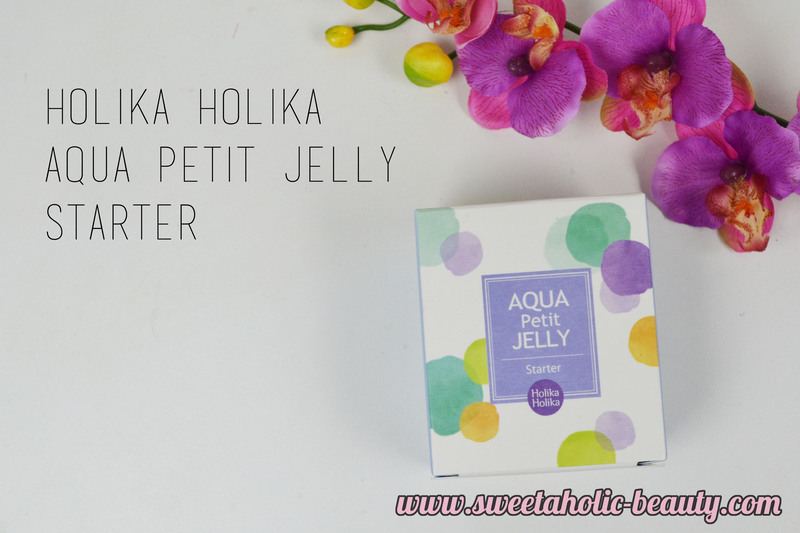 Have you tried the Holika Holika Aqua Petit Jelly Starter yet? If so, what are your thoughts? What do you think about Asian cosmetics? What an interesting product! I've never heard of this brand before, but the word 'jelly' in there makes it sound attractive to me. I don't think I have any experience with Asian beauty products, really! Whoa, this is such a strange looking product! I've been loving glowy primers for winter, sounds like a lovely product! I've never used any Asian Beauty products! This one sounds like a great product definitely worth trying! I've heard such great things about this! It looks so fun to play with and amazing on youtubers.